Tropical fruit makes up a significant part of the UK diet. From bananas and pineapples to kiwi fruit and passion fruit, our mealtimes would be less interesting without a little taste of the exotic now and again. 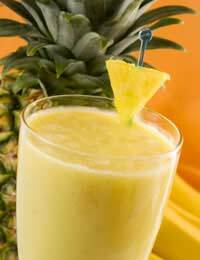 The recipes in this article are designed to get your taste buds into gear, and think about using tropical fruit in interesting ways. Instead of blackberry and raspberry jam, why not try spreading kiwi fruit on your toast in the morning? Or barbeque pineapple to provide an interesting addition to summer parties. Tropical fruit is as versatile as our home-grown fruit, and these recipes are just a small sample of how many varied ways there are to eat it. Add the mango pieces and sprinkle with a light dusting of icing sugar.